In Sèvres, in the suburbs of Paris, there is a cylinder of diameter and height approximately 39mm, composed of an alloy of platinum and iridium, milled and polished until it reflects like a mirror, stored under three glass domes in an underground vault which can be opened only with three different keys controlled by three different officials. 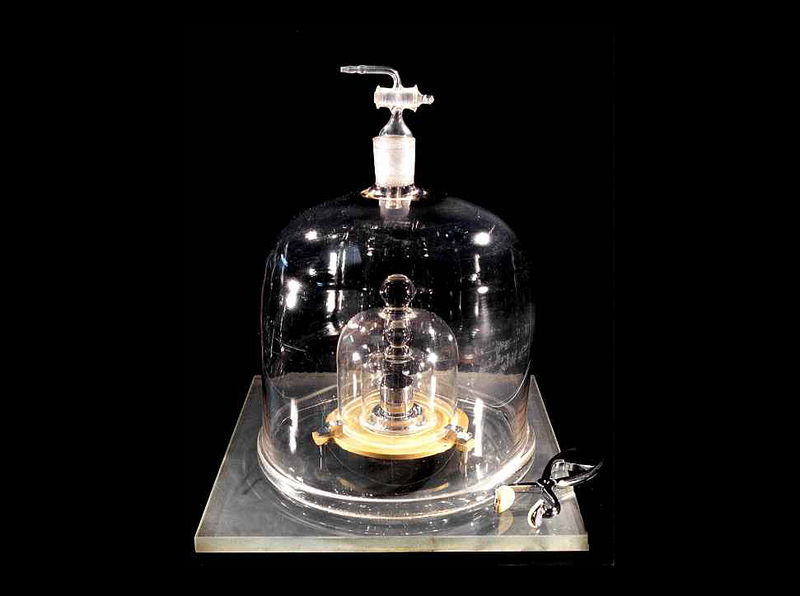 It weighs exactly one kilogram, by definition, because it is the kilogram, the kilogram, le Grand K, the International Prototype Kilogram (IPK), the single artefact that since 1889 has defined the measure of mass in the metric system. Although it hardly ever leaves its vault le Grand K exercises a discreet sovereignty over scales in commercial and scientific use throughout most of the world via a chain of technical and regulatory authority. On the technical side it sits at the apex of a hierarchy of physical standards : identical copies held by national scientific institutions (the UK's is in Teddington) to which are calibrated stainless steel 'secondary standards' to which in turn are calibrated the steel 'end user' standards to which commercial scales are required to conform. The regulatory aspect runs from international bodies established under the Metre Convention of 1875 to national governments and ultimately to local monitoring and enforcement agencies (in the UK, the last link in the chain is provided by local authority trading standards officers). As a result of all this, the calibration of the scales in any high street greengrocers should be 'traceable' all the way up the chain, back to that one cylinder in Paris. This is set to change later this year, when a new definition of the kilogram based not on a physical object but on Planck's constant is expected to be adopted: progress, but at the cost of a little poetry. The genealogical line of physical artefacts that links your local greengrocers' scales to le Grand K makes the rather abstract subject areas of metrology and international regulation more concrete, almost tangible, gives material content to the cliché that a lot of things we take for granted don't just happen. Not that long ago in historical terms, weights and measures could not always be expected to be consistent even over relatively short distances, let alone internationally. Pity the Italian merchants (and their customers) who had to deal with the coexistence of the Milanese libbra grossa of 28 once (equivalent to .763 of a kilo) and the Venetian 12-once libbra grossa (equivalent to .477 of a kilo). The godfather of modern theories of state sovereignty, Jean Bodin, lamented in 1576 that while 'the regulation of weights and measures' was one of the rights of sovereigns, in France 'there is no lord so petty that he cannot pretend to this authority by right of local custom, to the great detriment of the commonwealth', frustrating the efforts of monarchs since Philip the Fair to unify the system. In the event unification would not happen until the French Revolution and the establishment of the kilogram and metre, destined for global hegemony. It is not unusual for the trappings of national sovereignty to be somewhat detached from the international systems of rules that make things happen: unfortunately the current political climate tends to impose a sinister interpretation on this sort of thing. One can easily imagine the Bureau International des Poids et Mesures in Paris being cast by some UK politicians as a shadowy conspiracy of unelected bureaucrats plotting to impose the alien rule of le Grand K on the British people even after they have shaken off the yoke of Brussels. Sillier things have happened. International law and regulation influence everyday lives in innumerable ways these days, and as the example of weights and measures shows, this is not something that is necessarily best viewed through the prism of national sovereignty. It can of course be argued that this particular area of international coordination is peculiarly benign. Standards for weights and measures do not generally engage the more invidious instincts of governments or express contested social values or arouse special interests, and the existence of a common system has clear public good properties, in the sense that benefits to one do not come at the expense of others. Putting it mildly, not all of this can be said for all forms of international coordination (think of WTO negotiations). This is true, but it shouldn't blind us to the fact that largely uncontentious forms of international coordination are hardly uncommon. Indeed they are ubiquitous. They are not usually newsworthy unless something goes wrong, or someone drunk on sovereignty is looking for a fight. Otherwise we take them for granted. When you post a letter to another country, you have good reason to expect it to arrive. You can access a mobile phone signal while travelling. When it is midday in London, it is nine p.m. in Brisbane. Medications in which the active ingredients are measured in billionths of a kilogram are exported and imported. And there is no border between Northern Ireland and the Republic of Ireland. All of this happens, and none of it just happens.